This fish stew recipe totally rocks. I have been searching the Internet for years, looking for great recipes to fix, tweak and make my own. 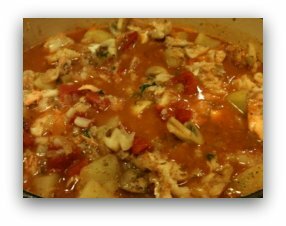 Very seldom have I come across a smoked fish stew recipe. So, I decided to make my own. Give this a try. Even if you decide not to smoke the fish, you will love this recipe. It is hearty, healthy, and a stew your family will love, even if they say they don't like fish. It's worth a shot. Oh, and don't forget to have some crusty french bread with butter on hand to dip in the broth. So good. In terms of the fish, I went to the local supermarket and looked for fish that was on sale. I picked sole, cod and salmon. You could also use shrimp, scallops, mahi-mahi, swordfish, catfish, grouper, snapper, you get the point. Almost any fish will work. This is a very versatile stew. To smoke the fish, I set up the kettle grill with indirect heat, meaning I placed 15 or so briquettes of charcoal on one side of the grill and lit them. Once it was 60% gray, I put a handful of hickory chips on the coals. Once the hickory flamed out, the coals were ready. As you will see in my video I used a couple of containers to hold my fish, but you can also spray down the grill grate with a no-stick cooking spray or rub it down with olive oil. The fish may still stick a bit, so be certain to use a very thin metal spatula when removing the fish. I seasoned the fish with a Cajun seasoning and smoked it for roughly 12 to 15 minutes. The fish finishes cooking in the stew. Heat the olive oil. Saute' onions and celery until fairly clear and translucent. Then add garlic. Total saute' time is 5 to 7 minutes. Add all other ingredients and bring to a slow simmer. In this case I smoked my fish, so it was 60% to 70% cooked already. If you don't smoke your fish, it will take a bit longer. Break up the fish once it gets flaky in the stew. If you have time, smoke the fish outside. It's worth the extra step, as it adds a nice smokiness to the stew. And remember, you can really use any fish you would like. This stew if very versatile. Serve with crusty french bread. If serving with wine, offer a red Pinot Noir. If serving beer, pair this stew with a nice Pilsner. Do you have a question about this recipe? If so, Click Here. He will get right back to you within 24 hours, probably sooner. Dave sends out a monthly email with unique comments and suggestions that can only be found here. Just fill out your first name and email address. And no worries, Dave doesn't share your email address with anyone.